What a whirlwind weekend I've had! Thursday morning my husband and I left home very early (too early to mention!) to drive to Louisville, Kentucky. We love trips and drive almost everywhere. I grew up in Montana and if you wanted to go anywhere you were looking at a long drive, so long road trips are very normal to me. So many of my friends groan and say they couldn't do it...give 'em a plane any day! Not me! Well, I love to fly too, but there's something about being in the car watching the scenery of our beautiful country roll by. I love it! We drove all day Thursday and we drove home all day yesterday, Sunday. Poor hubby...he had to get up at 4:00a.m. to drive halfway across the state of Kansas for his job this morning. So, that's why you haven't heard from me the past 4 days....I did not bring my laptop and I don't have one of those "fancy phones" so, with no internet I couldn't get online. It was a nice break actually! This cute little Bat Box and the Spooky Box were created using the Candy Wrapper Big Shot die and embossed with the Elegant Lines folder. 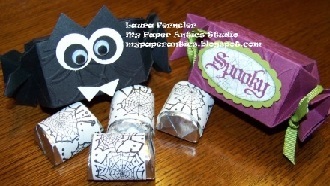 "Spooky" was stamped with the Wicked Cool stamp set. 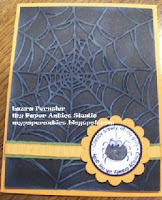 The spider webs are a retired Stampin' Around wheel. The spider web card is so cool! I saw it on a display board at a Stampin' Up! event and have used this idea so many times. 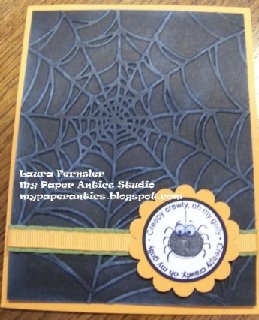 The darling little spider is from a retired set, but I had to show you this cute little card anyway. When I designed this card I had to purchase a package of googly eyes and get really frustrated while I tried to stick them on those tiny little spidey eyes...but NOW....Stampin' Up! has a pacakge of adhesive-backed googly eyes that are SOOOO easy to stick on! Well, I still haven't heard from either of the two gals whose names were drawn for my first card set drawing. So, I'm closing that drawing and although it's 3 days late....it's time for the 2nd weekly drawing for a card set. I'm going to use the same set of cards, since I still have them. So, I'm going back to the bucket of names and drawing a new winner for last week. I'll post again this evening who the winner is! I hope it's you!